The world of Social Media is rapidly evolving. Having a well-founded social media policy is essential to preventing, detecting and responding to risks associated with employee social media use. It is important that your Social Media Policy aligns with your corporate values, complies with existing laws, receives frequent review, and is effectively communicated to your employees through training. 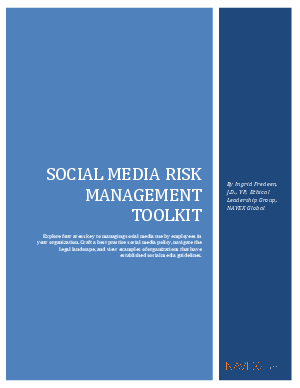 The 2013 Social Media Risk Management Toolkit offers a four-prong approach to addressing risks created by employee use of social networks. Inside you will find tools to help you craft, benchmark and implement a Social Media Policy, navigate the complex and evolving legal landscape, and address how employee participation in social networks intersects with workplace harassment and retaliation risks.